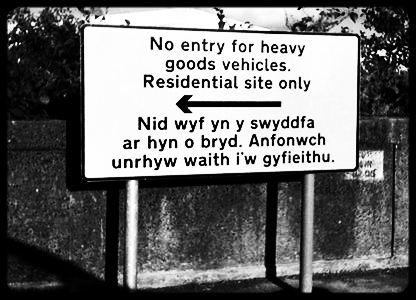 Wales has two official languages, Welsh and English. All Government material, including sign-posts has to be available in both. "I am out of the office at the moment. Please send any work to be translated"
Clearly the management and the printer did not speak Welsh. Clearly the management and the printer did not check with “market place” that the message was understood. check they used it properly. If they’d done the second, they’d realise they hadn’t done the first. Front line employees bamboozled with management speak during “town hall” presentations. Marketeers in love with their products write copy focussing on features instead of broadcasting benefits. There must be a country called ‘Translation’ which is full of senior managers and marketeers who are lost. Property is expensive. It's full of wealthy people frustrated that things aren't getting done. To learn a new language you have to do some research and develop your skills. To learn the language of the market place you need do Customer R&D®. You develop products, why not customers. Learn more about Customer R&D® here.